Probably all of us had overcharged our batteries at one time or the other. What happens when you overcharge a battery? This is something that you should know about, so you’ll know what to do to prevent further damage both to the battery and the device. For car batteries, for example, the latest cars have alternators that turn the controls in the internal voltage regulation. When you are driving, then the internal mechanism is such that the voltage regulator will keep sending an electrical charge to the batteries. In case the voltage regulator stops working, then the electrical charge sent to the battery becomes unregulated and uncontrolled. This leads to the batteries being overcharged. When the volts are incorrectly set, or the settings are the high amp, then the battery overheats and charges too quickly and cannot be used for its assigned purpose. The battery may stop functioning. This is the least possible damage you can expect. A graver consequence of batteries getting overcharged is that the contents of the batteries such as sulphuric acid and water mix together and boil due to the heat. 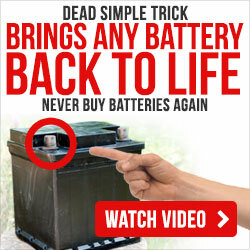 The exteriors of the batteries become too hot to touch, and the battery might melt or swell up, and leakage may occur. In this case, even if there is a little electricity that passes through the battery, then an explosion might take place. This is the most serious damage that may occur. We discussed above that sulfuric acid may start leaking from the battery so note that this acid is also an irritant to the skin and you must wash your hands with water thoroughly. Also, you must wash your hands immediately and with no delay. What are the solutions in case your battery is overcharging? 1. Replace the voltage regulator if it is faulty. This will cost you around $30-$40. Then the new voltage regulator will send the correct amount of voltage to the car battery. 2. Replace the alternator if it is faulty. This will again cost you $30-$40. This can be found easily and is quick to replace. The job of the alternator is important as it converts mechanical energy into electrical energy and makes sure that the batteries charge properly. So, when the alternator stops working, then the batteries die as it has stopped charging. Do check that the alternator you are using is correct for your car battery and not working at a very high pace and causing overcharging. 3. Replace the charger if it is faulty. This costs as low as $8. But it is more difficult to figure out when this is the problem as this is a manufacturing defect. In this case, what happens is that the wiring of the charger is defective or the charges are not labeled properly. Do check the charger regularly or get it checked at the repair shop to ensure that this is not the problem. Using the right charger is of paramount importance. 4. Park the vehicle in the shade. The hot weather is another cause of the trouble. This adds to the woes of an overcharged battery. The one thing you can do is park the car in the shade and avoid overcharging. 5. An important nugget of information is to ensure that your battery is not getting charged more than 15 volts. That is a risk level and should not be allowed to be crossed. You can measure these volts with the use of a measuring device called the multimeter. 6. When you are planning to charge a battery that has been sitting idle, then use a battery charger with a low amp setting. This trick is called trickle charging which means little charging and is considered the best way to charge an automotive battery. This is a great method and converts the useless lead sulfates back into the usable material. When your battery is worn out or idle, and you use a high voltage charger, then that will lead to overcharging, and also, you can avoid this issue by also reading my tips here. 7. To prevent this problem from happening is cleaning the terminals of the battery. Remove the terminals and use a brush to clean them. Then install the terminals back and spray what is called a terminal lubricant. 8. The next step is using batteries maintainer instead of a battery charger as that will ensure that the batteries charge up to an optimal level. 9. Make sure that when the battery is charging, then it is being done in a well-ventilated space. Hopefully, you will be able to follow these steps to address what happens if you overcharged car battery and how to fix the subsequent problems that arise because of it. If you want to know more about the actions you can take when it comes to overcharged batteries, drop us an email and we’ll send you useful information that can help you with those issues.